Pictures out of Newfoundland this time of year remind me of a conversation I had with an elderly gentleman on the Northern Peninsula of Newfoundland about fifteen years ago. He was an interesting man, salt of the earth, friendly and eager to talk to anyone who stopped near his home. I think of him every time I see pictures of polar bears in Newfoundland. It woke the neighbourhood. Somewhere nearby a car sent its repetitive horn blasts into the quiet of the night, alarming everyone for several streets around. A rash of break-ins in the area recently meant more people installed alarm systems in their homes and cars. Periodically we woke in the early morning hours when a wireless alarm sounded. There was a time when an alarm was less high tech. I learned of such a system when my mother, mother-in-law and I visited L'Anse aux Meadows on the tip of the Northern Peninsula in Newfoundland. It was the summer tourist season; we visited the former Viking settlement, drove around the area, stopping where the road led to a small turn-about near the ocean. We were at the far northern tip of our beautiful island, in a place where it looked like a nor'easter could sweep away the little house and shed not twenty feet from the water. You could see the coast of Labrador in the distance. "We're fine. How are you?" "Alright. Can't complain too much, ya knows. Nobody wants ta hear it anyways," he said. "Yees, moy dear. Me an' da Mrs. 'ad ta leave a few toimes when da seas were warshin' o're da 'ouse. 'Ad ta use da boat one toime cos everyting were awarsh. Got da goat out o' da shed just afore 'e warshed away," he added. "Few toimes o're da years. 'Ad ta sove da goat, Mrs. Cudna 'ford anudder one," he said. "Yees, Mrs. Not only dat. She's a good 'larm too, moy dear. Lits us know wen a polar bear is 'round. Kicks up some racket she do when deres a bear comes ashore in da spring. Wen 'e gits dat toime o' year and da goat is goin' nuts, we knows wats 'bout. She'll woke us from a deep sleep, moy dear. Goats ar' great fer warnin' 'bout da bears, Mrs," he said. Would a goat be a good alarm for thieves, I wonder? And the milk would be a bonus! Note: Polar bears are not usually residents of Newfoundland. 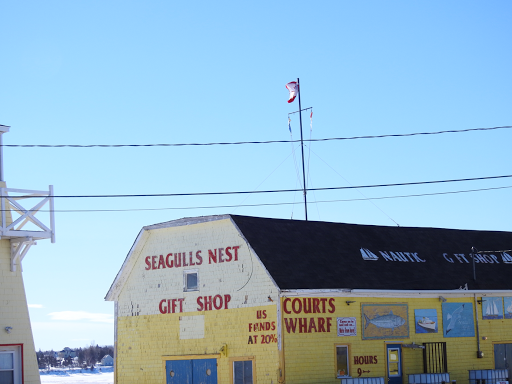 In the spring, they float south on the ice flows from Labrador and swim to the island. People throughout the Northern Hemisphere are posting colourful spring photos but bulbs with bursts of colour are not springing forth here. 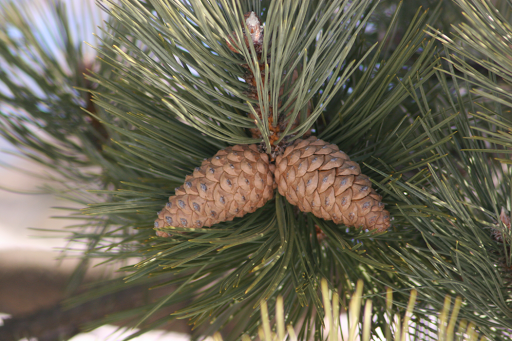 My husband and I were anxious to find some signs of the season too, though not the traditional ones. Many places north of the equator are weeks ahead of our progress to spring. 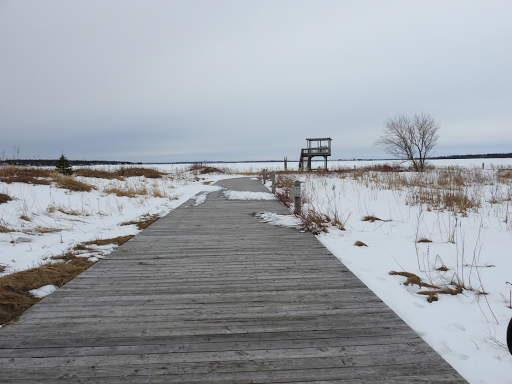 Here, smelt shacks are gone from the bay. They must be removed from the ice by the end of March. 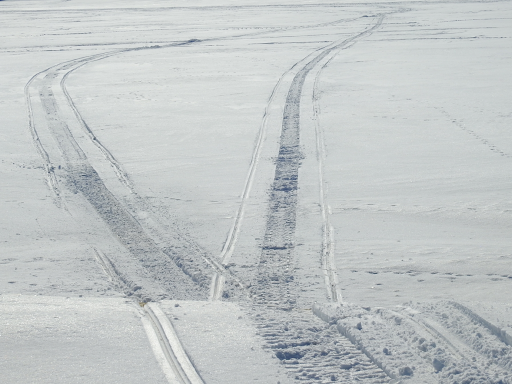 However, usually ice conditions precipitate their removal, not the calendar. 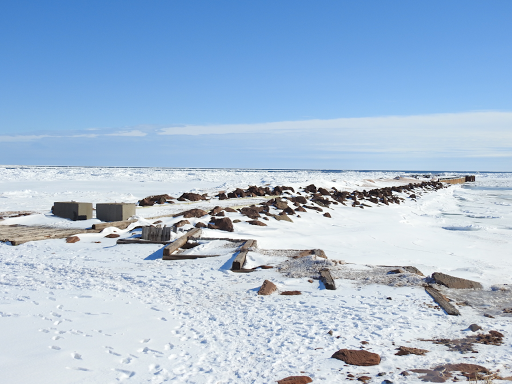 A few of the shelters remain along the shore, waiting to be hauled home for another year. 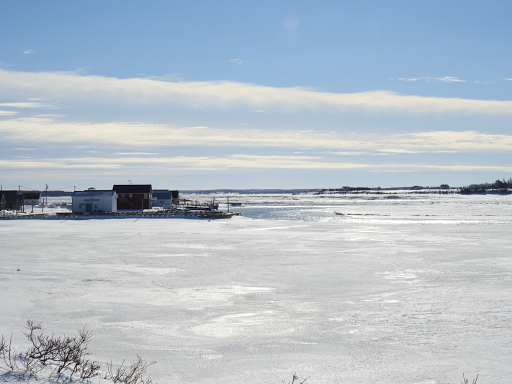 Ice in the inner part of the harbour is breaking up. 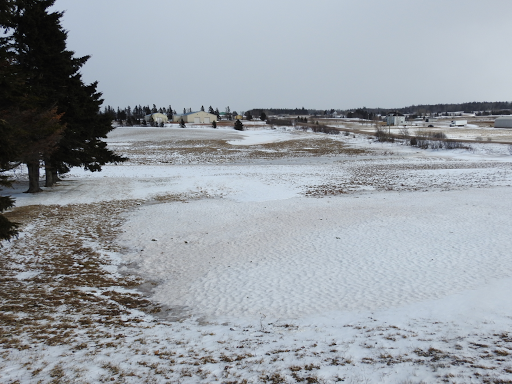 Patches of water are visible now, though the temperatures are below freezing. The March sun has more heat over the longer days and it is melting the ice along the shoreline, though the gray sky and cold mean no melting today. Geese are back. We saw them on the first day of spring. How do they feed when there is so much ice and snow around the island? 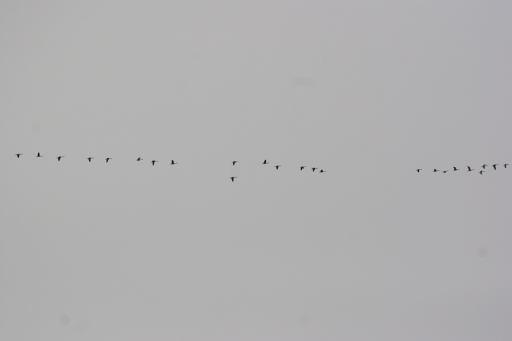 Yesterday, we heard more than saw the large gaggle as it honked its way across the heavy sky. 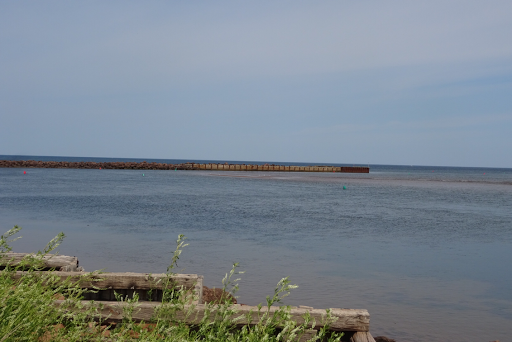 The outer part of the harbour has open water now. Wind has blown the ice off shore. 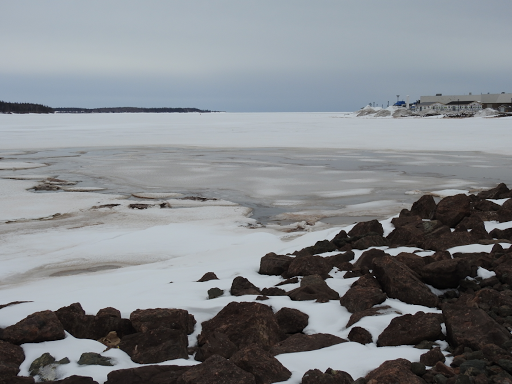 Four months of ice on the harbour may soon be over. 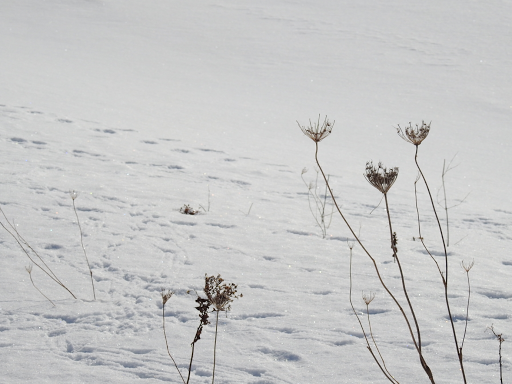 Banks of snow are looking their age too. 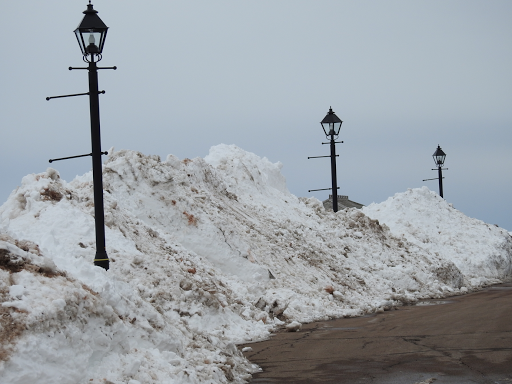 Melting will be slow, but time will take care of this snow bank, just not this week. Temperatures are below zero during the day and more snow is forecast for the next two days! Bulbs won't erupt through the soil any time soon around here. We look forward to April! 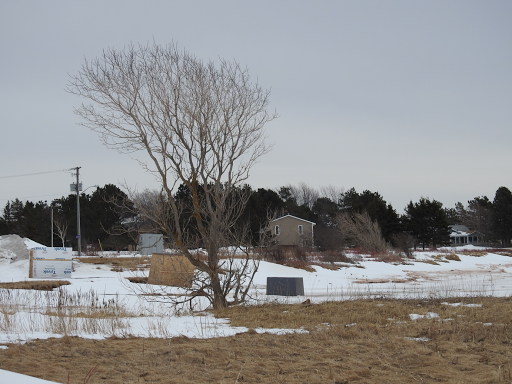 It is not standard issue, a rectangular box planted on a post outside homes in rural Prince Edward Island. Islanders are often creative with their mailboxes. The most interesting ones are usually at the end of long driveways leading to a country farmhouse. We have seen some unique mailboxes but the most unusual one thus far is on the side of the road across from a farm in Lower Bedeque. This mailbox spent its best days as a lawn mower, the ride-on type. 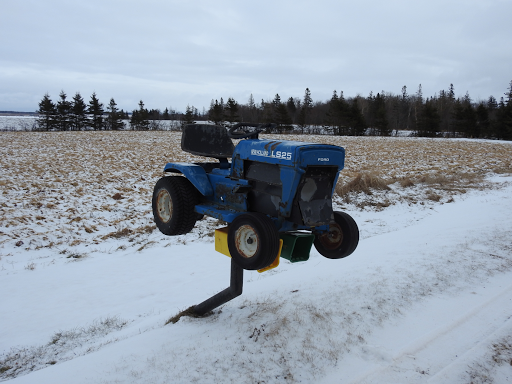 Such movers are common on this island where people have large swaths of grass to mow, making hand moving time consuming. This little mower cut many blades of grass by the look of it. Today it is well maintained and stands waiting, regardless of the weather. This Ford mailbox also has newspaper holders, the yellow and green pockets under the machine. A lever on the right side is lifted to indicate you've got mail. The mail is deposited in a covered pocket under the front engine area. 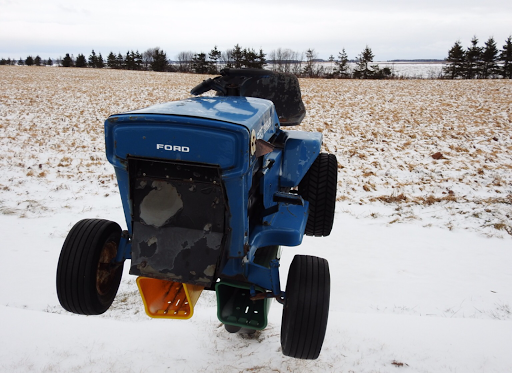 Someone looked at the old mower and said, "Mailbox," and there it stands. A creative way to recycle! We heard the quick tapping sound long before we saw the source. A woodpecker was busy nearby. 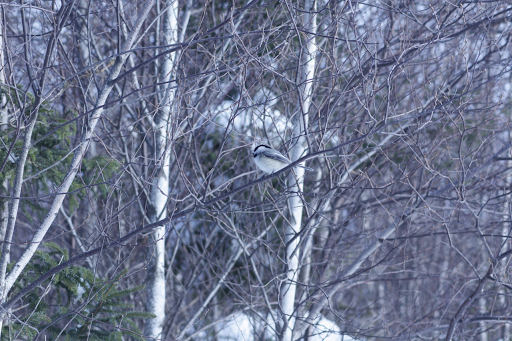 We stopped and listened, hoping for a glimpse of the industrious avian. Before long we saw it flying through the trees. 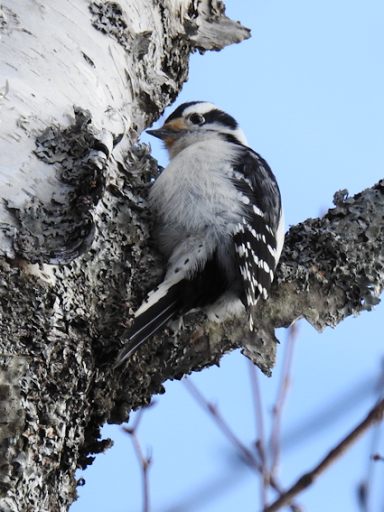 After a few minutes, Woody perched in the tree in front of us. It was a treat to see this tiny driller. 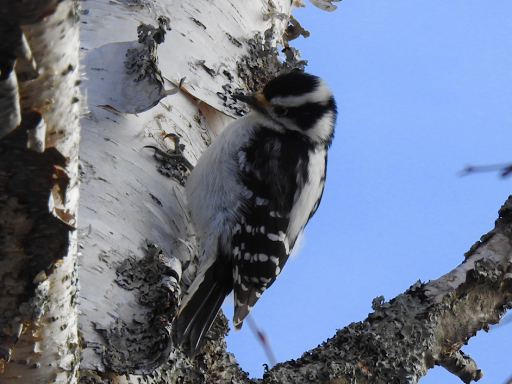 The hairy and downy woodpecker with its black and white plumage, blends with the birch tree trunks, but his drilling gives him away. He doesn't stay long in any one spot, just long enough to stir up some memories for us. We had a different encounter with woodpeckers years ago when our daughter was eighteen months old. She'd had surgery and my husband and I were exhausted and relieved when she recovered, so we had a few days vacation while his parents looked after her. We spent a weekend at their cottage, our first time away from our daughter. We looked forward to sleeping in for the first time since her birth. At 6:00 a.m. the first morning there, we were startled awake by a loud drill-like vibration on the outside of our bedroom wall. It sounded as if a tap was followed by echo vibrations before the next tap. It continued for several minutes. While our daughter didn't rouse us out of bed early that morning, a woodpecker saw that we didn't sleep in. There were woodpeckers in the woods around the cottage that weekend. We swore we could hear them jeering us, just like the character in the old cartoon. People of a certain age will remember Woody Woodpecker cartoons by Walter Lanz and Ben Hardaway. We grew up with those cartoons and Woody's distinctive "voice." Check out Woody's voice here. Now, you can have Woody's greeting as a ringtone for your phone. While we enjoy watching woodpeckers today, we'll just say, "No, thank you," to that ringtone. Cold and sunny, one of those glorious days when the wind didn't try to cut through to your bones. 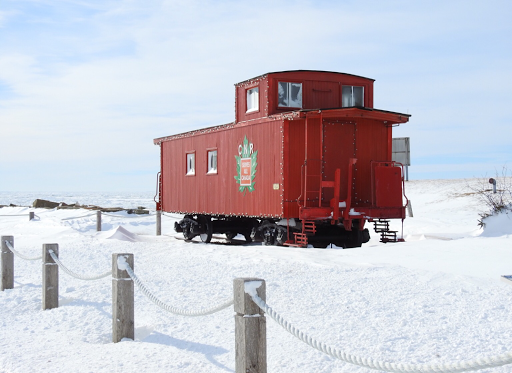 The park, near the entrance to the Confederation Bridge on Prince Edward Island, Canada, is frozen in time and place. 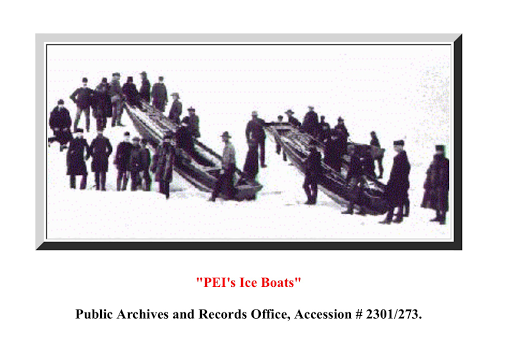 I cannot help but think of the history of the ice boats as I look out over the frozen Northumberland Strait. 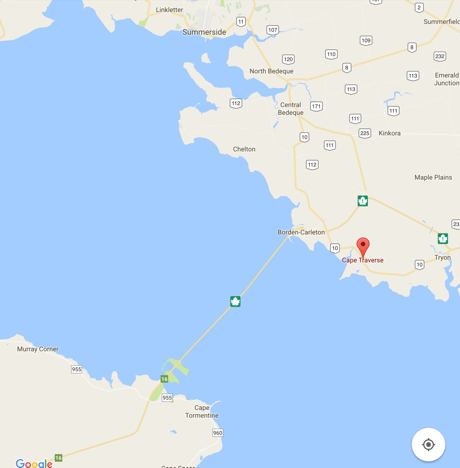 Imagine crossing that strait, 14.5 kilometers, or 9 miles, in a small wooden craft, pushed and pulled over the ice by the crew, who jumped into the boat in areas of open water. The primary purpose of the boats was to deliver the mail but passengers travelled in them too, some helping with the journey for a cheaper ticket. 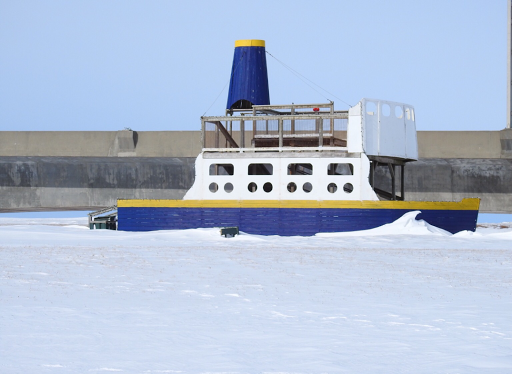 A short video about the ice boats is here. 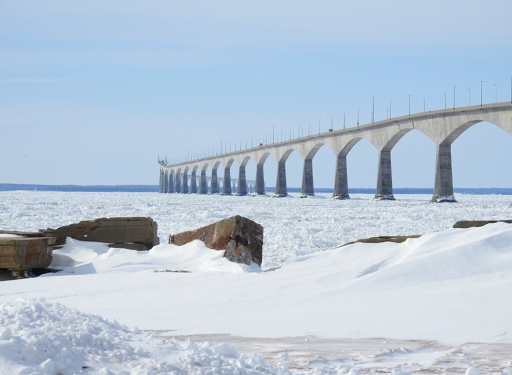 Cape Traverse, one of the ice boat ports, is east of where the Confederation Bridge is today. 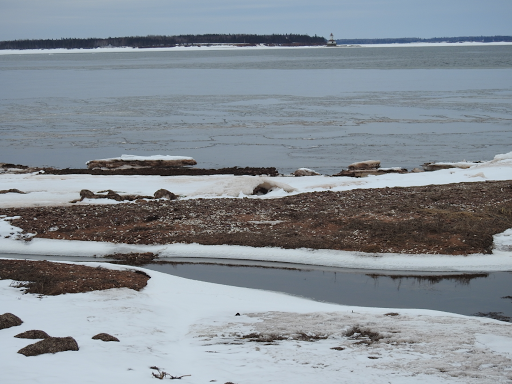 Looking out over that icy water in the strait today, I can only imagine what that journey was like in those days. The cold, wind, ice and water required brave workers and passengers too. 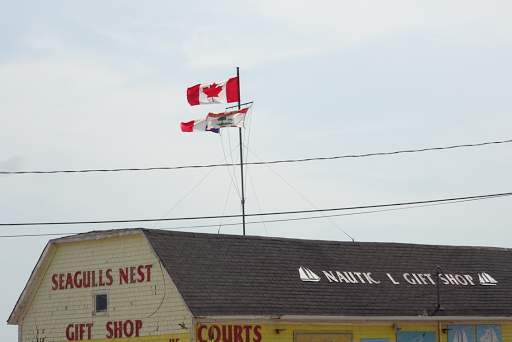 This history is another reason I love this island. P.S. A blizzard is forecast for later today. Winter's last gasp, we hope! 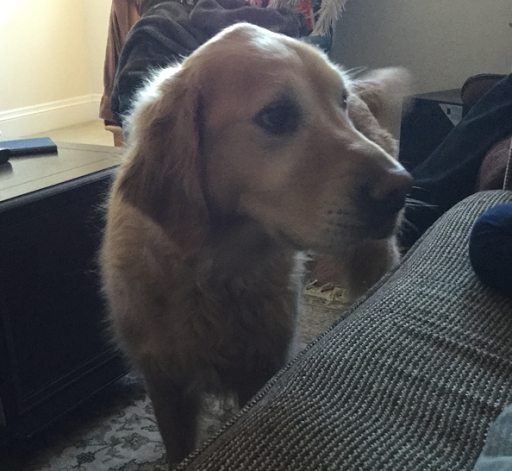 We had the grandkids overnight this past weekend and the grand-dog was part of the package. Usually when Georgie visits, her family is out of province. This time, only the parents were gone and the dog had to share her domain with the little ones. She was not impressed. When she visits on her own, Georgie lies on her green blanket on the other end of the couch. This time she was displaced by the Sylvie and Caitlin. She did not take it well. In typical Georgie fashion, she communicated how she felt. 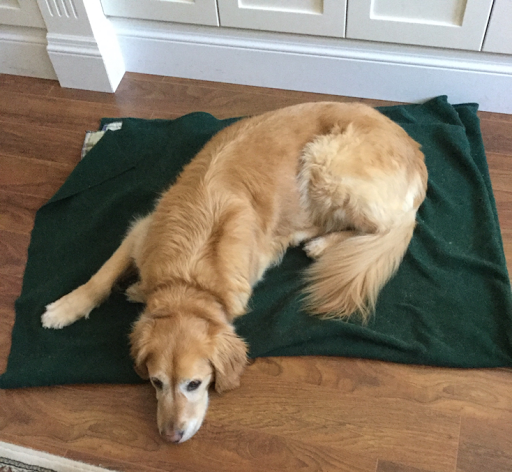 We laid her blanket on the floor and she settled there initially. Periodically she came to the couch, looked at Sylvie sat in her spot, then at me, back at Sylvie and so on. After a few minutes, she went back to the blanket again. The first opportunity she got, Georgie was back in her spot. Georgie is seven years old now, old enough not to like change, especially where comfort and tradition are concerned. You may be able to teach an old dog new tricks but she won't take them lying down in the wrong place for long. One of my favourite things is learning about other cultures and traditions. This includes family recipes which are passed down for generations. Learning a new recipe and the stories behind it are wonderful ways to share our lives over a meal and learn about each other. 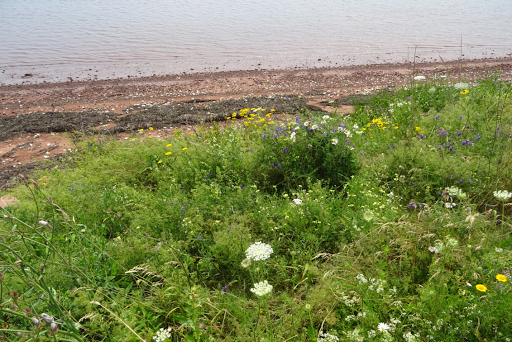 We had a frolic which in Prince Edward Island denotes any occasion when people get together to work on a project. Women had frolics for knitting, crocheting, or quilting as examples. Men had frolics to cut wood or build a shed. 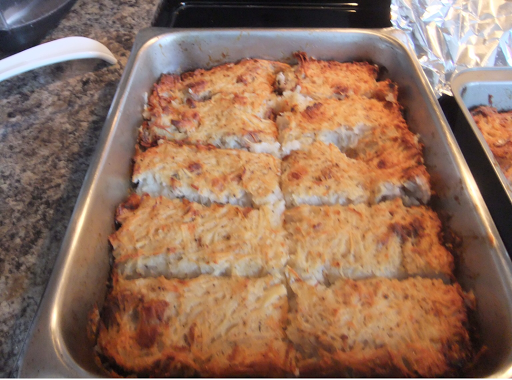 Ours was to make rapure, a traditional Acadian dish. We had baked apples for dessert. 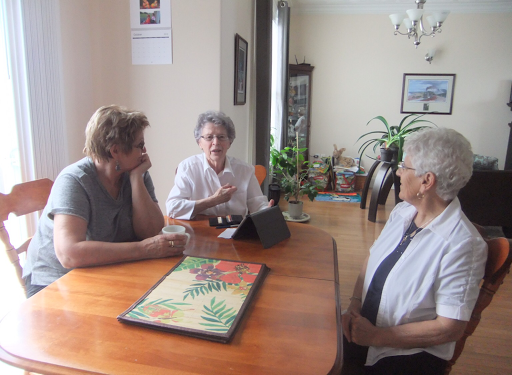 While she lived in Prince Edward Island, my mother-in-law, Sylvia, became friends with some Acadians. It was a pleasure for us to get to know this important part of our community. Their kindness and friendship helped Sylvia during the two years she lived on the island. Our curiosity about Acadian customs and culture led us to the preparation and sharing of this Acadian meal. Four of us prepared the rapure and baked apples. It was both fun and delicious. My husband shared our completed meal as well. Our friends were Angéle and Eleanor. Angéle is Acadian, raised in Mont Carmel, PEI. Eleanor's husband, Eldon, was Acadian too. Eleanor is from St. Augustine on the lower north shore of Québec. 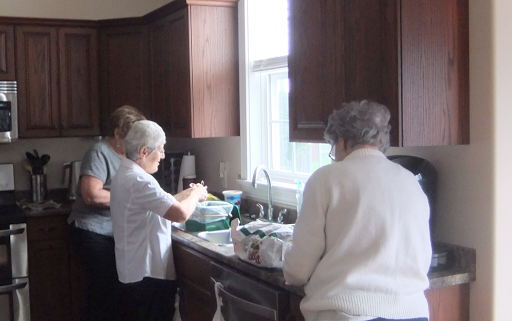 My mother-in-law, Sylvia, a fellow Newfoundlander, helped in the kitchen that day with her friends. Acadians are descendants of the early French settlers to Canada. When the British gained control of what is now the Canadian Maritimes, they drove the Acadians out of their homes. 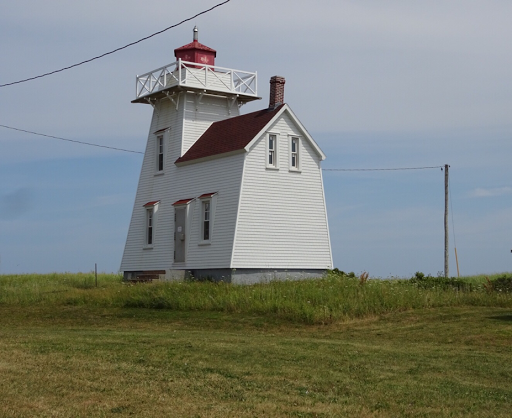 Some island Acadians fled to the woods and hid, later re-establishing themselves in the Evangeline area of western PEI. These families have kept their language and culture alive and they are a vibrant part of our island home. 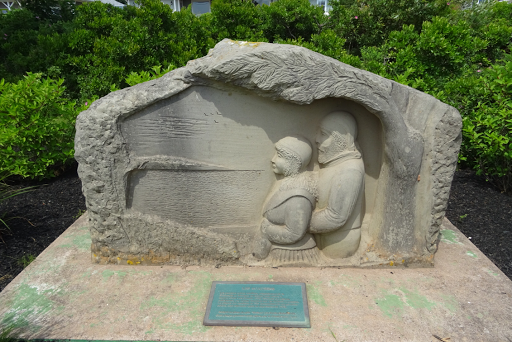 Acadians have a proud heritage which we were eager to know. Angéle's father was a fisherman who also grew vegetables and raised animals. Her mother raised the children and kept the house. She made rapure for her large family as a special meal. It is made with pork and grated potato, so it was labour intensive in the days before food processors. With ten children, you can imagine the amount of potato needed for the family and the grating was hard and time consuming work. The family loved the meal but it was not a common item on the menu. We used 10 pounds of Russet potatoes in this recipe. You must peel and boil at least five medium to large size potatoes in salted water. While the potatoes are boiling, peel and grate the remainder of the potatoes. Keep them in water to prevent the potatoes from darkening. Angéle says the best rapure is made with potatoes grated on a box grater. Today, a food processor hastens the work. Rinse the grated potato well and drain in a colander just before combining with the other ingredients. Meanwhile, cut a pork shoulder roast, about two to three pounds, into bite size cubes, trimming the fat. Saute the pork with one large chopped onion in oil. The meat and onion can be browned in the oven if you prefer. When ready to put the rapure in the oven, Angéle made the sign of the cross over the food saying, "St. Theresa and St. Martha, bless me that I may make a good rapure." Her mother always said this blessing and Angéle does the same blessing for bread. Cut the rapure into serving size pieces to plate and add molasses as you would to a pancake. The rapure is crispy on the outside and tasty, even without the molasses. Angéle's mother used the fat from the pork as well, not wasting a bit of the roast. The flavour from the fat and its presence in the rapure changed it from the recipe we have today, using only lean meat. However, her Mom's recipe for that time provided needed calories for the hard working family. Today, we are concerned with cutting fat from our diets any way we can. For dessert, we had a traditional island recipe of baked apples. We washed and cored the apples and put some brown sugar in them as well as chopped dried cranberries. You can use raisins also. A tablespoon of butter over the top of each apple helps create a nice sauce. Cook on 350 degrees F until the apples are tender, about 70 minutes in our oven. The two pans of rapure we made were different thicknesses. Some people prefer the rapure thin, with the crispiness going through the slice. Others prefer it thick with the crispiness on the top only. We made it both ways to see which we preferred. 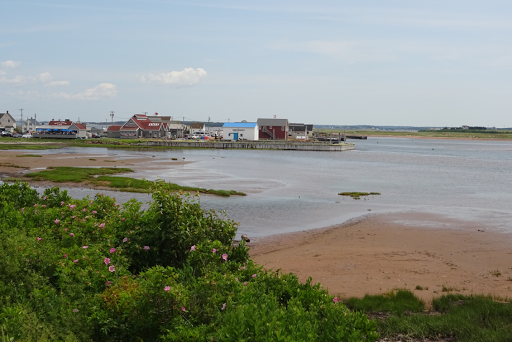 Prince Edward Island is an ideal place for growing potatoes so the rapure was a great recipe for families who grew their own potatoes, enough to carry them through to the next year if they were lucky. Some had animals as well, as did Angéle's family, though the children were not happy to see their named pets on the dinner plate. Apples grow well on this island too and many families had the trees on their property. They were an important part of every family's diet and apple trees are plentiful to this day. She darts around on the branches, never staying in any one place for very long. All movements, including flight, are quick. 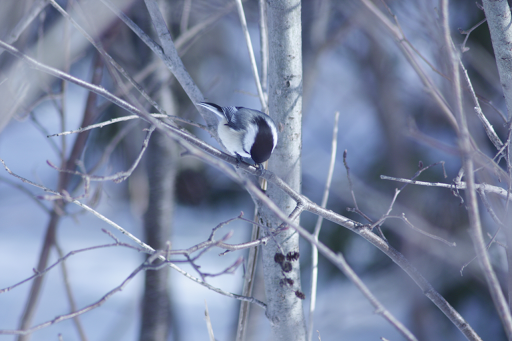 The tiny birds with the short, sturdy beaks are at home along the trail we frequent in Summerside, Prince Edward Island. They blend with the tree branches this time of year, only catching one's eye when they flit or hop around. We pause to observe. She's quiet now and keeps her chick-a-dee-dee-dee sounds for later. This time of year, the little birds are fluffy and puff their downy feathers, trapping air next to their skin. 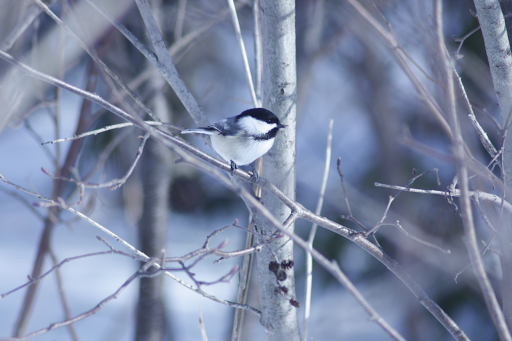 Body heat warms the air so the chickadees can live in the cold temperatures. 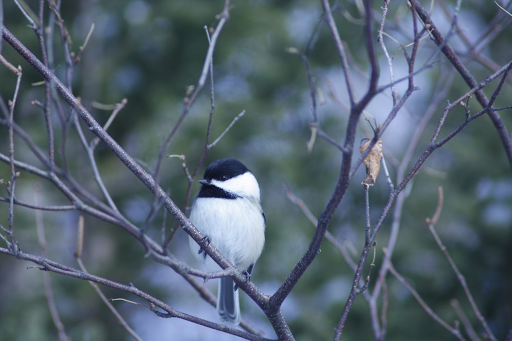 These black-capped versions have black hoods on their heads and a black bib, white cheeks and gray backs. Our friend today does not have the buff coloured sides like this bird from last summer. 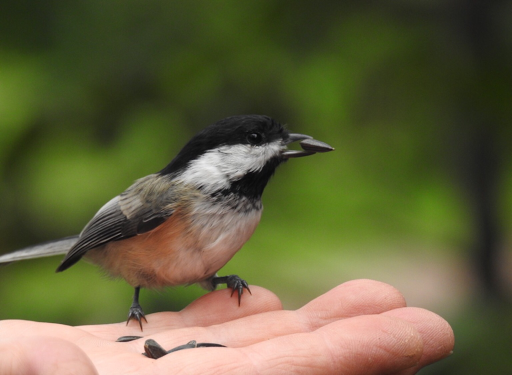 They love sunflower seeds and will feed from your hand if you are patient. 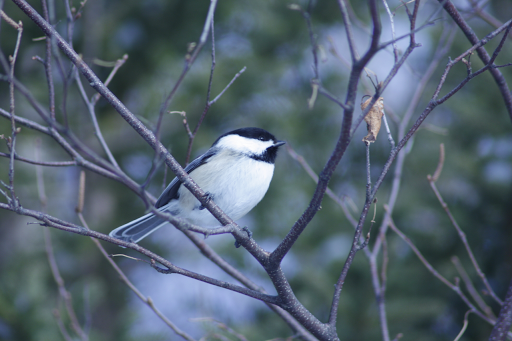 In the photo above, the chickadee is her slimmer self, lacking the air trapped under her down. Today, the little bird poses as if to say, "Is this my best side?" Finally, she bows, as if to acknowledge the applause of her admirerers gathered below. Then she's gone. We can hear her singing in the trees above as we move on. 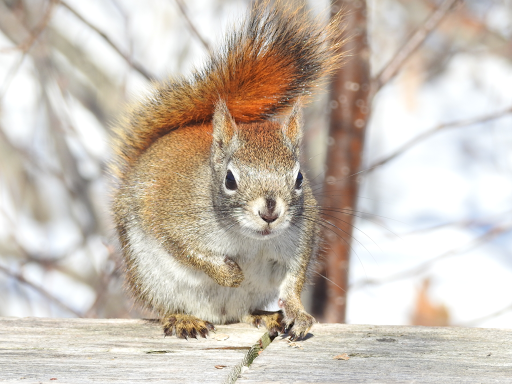 The squirrels who live along the boardwalk in Summerside, Prince Edward Island, are a delight to the residents who frequent the area. Residents, from children to seniors, enjoy watching and feeding the squirrels and the little red rodents take advantage of their generosity. 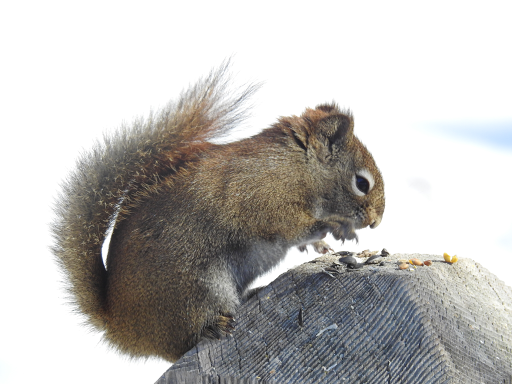 Squirrels who live near the river are tame and will take peanuts from one's hand. At least they did. This past week, those same squirrels were skittish. When they saw peanuts, they approached but would not come close enough to take them. This was strange behaviour for these usually brave creatures. We left some peanuts for them and continued our walk. Near the turn around, where few squirrels lived before, there was a scurry, at least ten of them, running through the woods, some approaching walkers who offered them food. As usual, people stopped, talking about the animals, sharing stories of their antics. "These squirrels are more friendly than the ones we encountered earlier," I said. A man nearby added, "That's because two young fellas shot two squirrels with BB guns back there. The lads were caught though," he said. 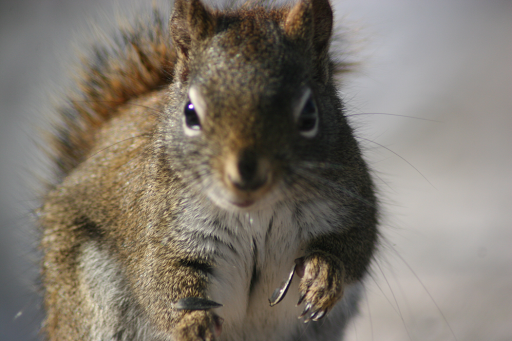 Could it be that the squirrels by the river had not forgotten the incident and did not trust people as a result? 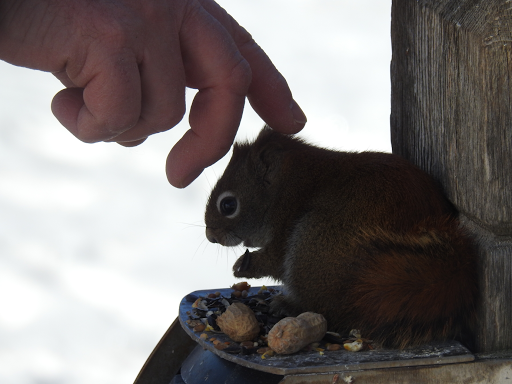 Meanwhile, the squirrels at the end of the trail were tame enough to touch. Sat on one of the light posts, one young squirrel ate the peanuts left for him and allowed people to touch him, which we had never seen before. Let's hope nobody has to go to Emergency! My husband put two peanuts on the ground, a double nut peanut and a single. One squirrel chased off his buddy and took the larger shell, leaving the single nut for the other. Size matters to squirrels! 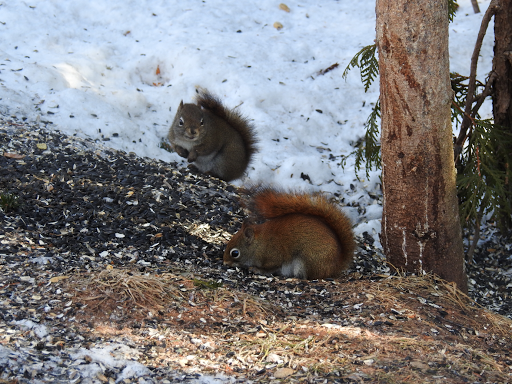 The cute red rodents along the boardwalk are fascinating creatures who are appreciated by the adoring public. It will be interesting to see if two misguided young people will cause a permanent change to how one group of squirrels react to people. Two degrees Celcius and the sun is shining. The frozen bay is spread before us! 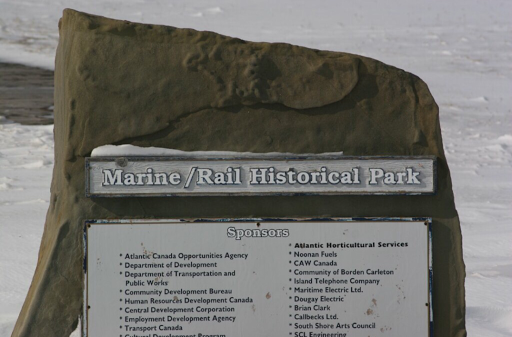 My husband and I are dressed for the cold as we park by the boardwalk in North Rustico on the central north shore of Prince Edward Island. We haven't been back here since July and everything is covered in its frozen shroud. 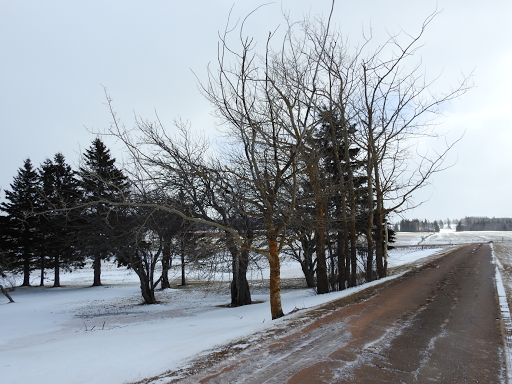 We are curious to compare the scenes of summer with winter in North Rustico. 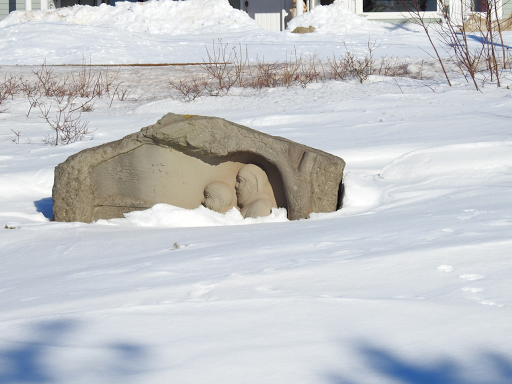 The Acadian monument is partially buried in the snow now, waiting for its time to remind visitors of that proud heritage. The shrubs behind the monument are mere skeletons of their former selves. Only vestiges of some plants, such as Queen Anne's Lace, remain now, the stalks and seed pods having survived the worst nature can dispense. 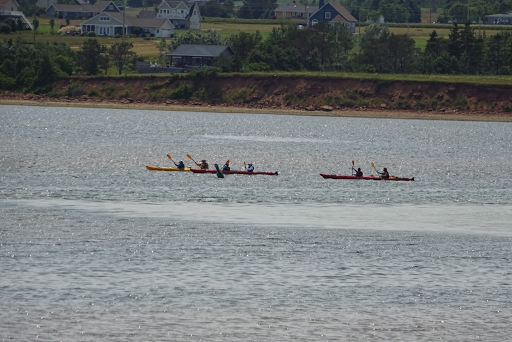 The entrance to the bay is the only open water in the March setting. Winds have taken their toll on the patriotic display at Court's Wharf. 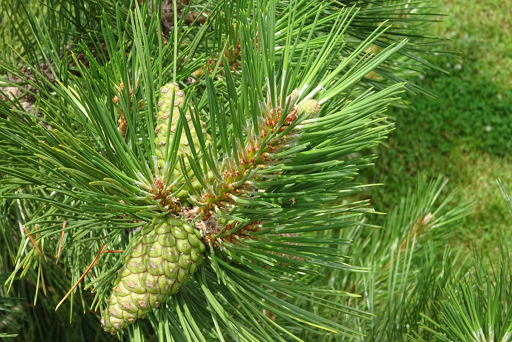 The pine trees have lost their brilliant green as a result of the decrease in daylight hours in the cold season. Ouside the bay, the breakwater is encased in ice and snow. Activity on the bay is different now, snow machines replacing human power. Yet, some things never change. 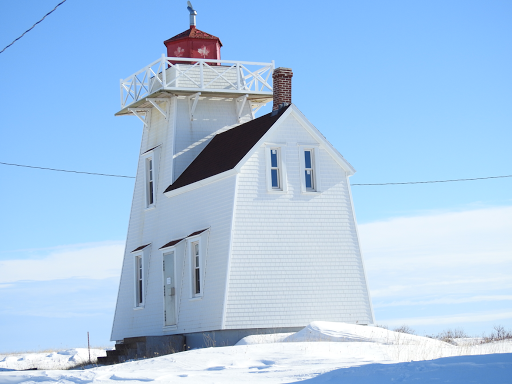 The lighthouse stands vigil as it has for almost a century and a half, though it might be ready for spring. We are! 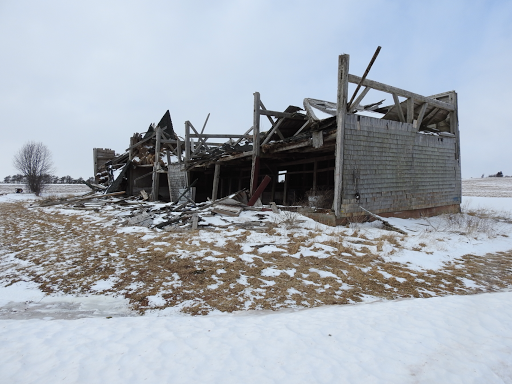 The old farm is in the rolling countryside of Prince Edward Island, away from the cities and the shoreline, deep in farm country. There, on this bitterly cold March afternoon, it feels cold enough to freeze time itself. And in a way, it is. My friend, Lucy, has purchased the old farm and is renovating the house for her future, with all the necessities on the ground level. 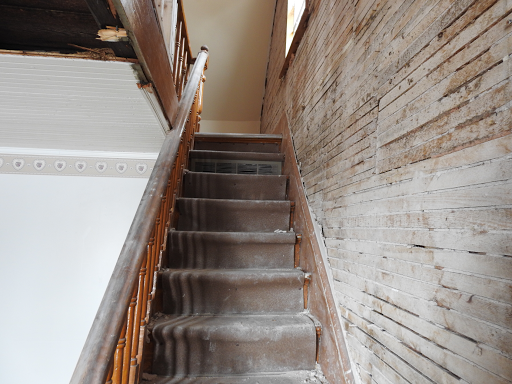 During renovations, the house provides a glimpse of the past and stirs up some great memories. The original house was built in the 1880s and just beneath the surface, it is a time capsule. 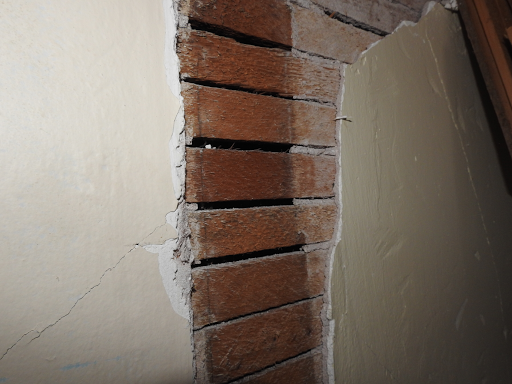 Underneath the plaster covering the walls are the laths used in house construction in Canada until the 1950s. A closer look at the beams in the ceiling is interesting as well. 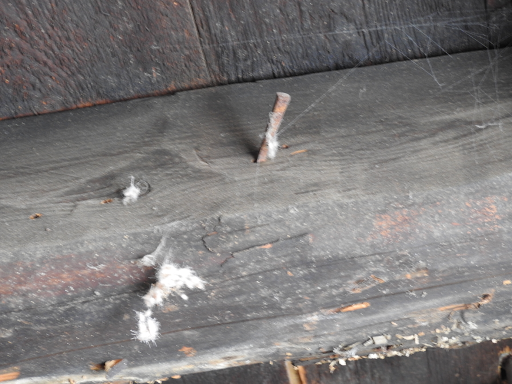 Who knew that nails were square at one time? And who nailed them there so long ago? Their identities are in the genetic code and records of other families, pictures faded in old boxes, stories passed on through the generations. 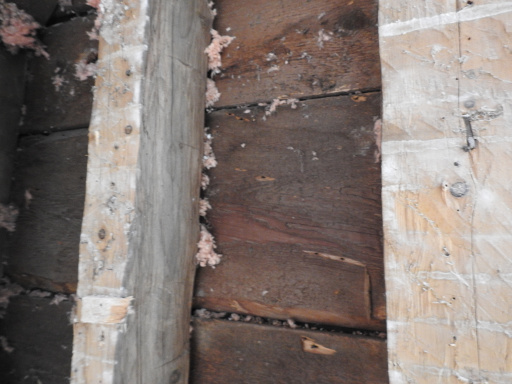 The wood on the exterior of the house, under the siding, is varied in size and not finely milled as one would see today. Those old wood forests are gone from the island now, cut for construction of railway, homes, barns and buildings more than a century ago. The individual boards, some quite wide, stood the test of time. 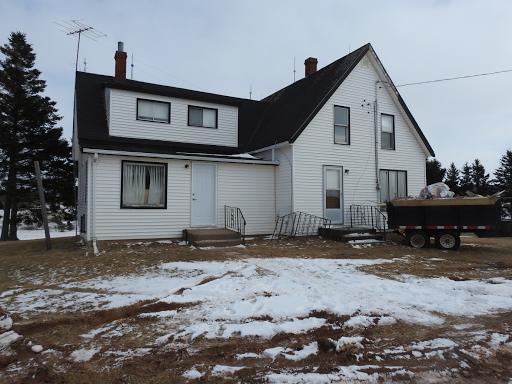 A wood stove heated the home against the wind which could bite through the walls. In more recent times, the owners had insulation blown into the walls, so the old house was warmer than it had been a century ago. The stairs are narrow, leading to an upper floor with sloped ceilings. Walking up those stairs takes me back to my childhood in Newfoundland to my great grandmother's house. There, similar stairs led to an attic where I loved to play. It was magical to me with its sloped ceilings, giving it a cozy feel, the beds tucked under the roof line. 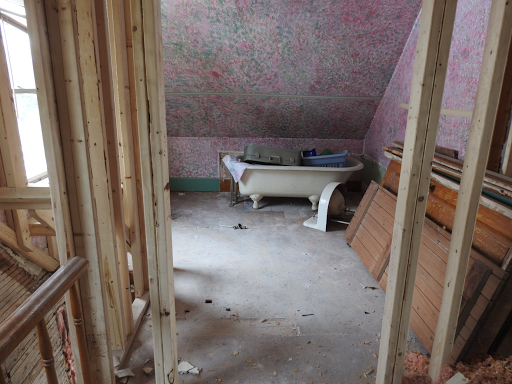 The old tub was like the one in my grandfather's house where I spent the first few years of my life. As a teenager, a bath in that tub felt luxurious! Up those stairs, time turned back sixty years with memories of places and people I loved! Outside, the old trees include pine and poplar which are dead, their skeletons making interesting designs again the sky. Nature has begun to reclaim them already and Lucy will do the rest. She plans to sit on her patio in the morning sun and look out over the countryside, which includes a little stream that runs through the valley. Knowing Lucy, she will have a spectacular garden like she does at her present home. while another building may house some animals. 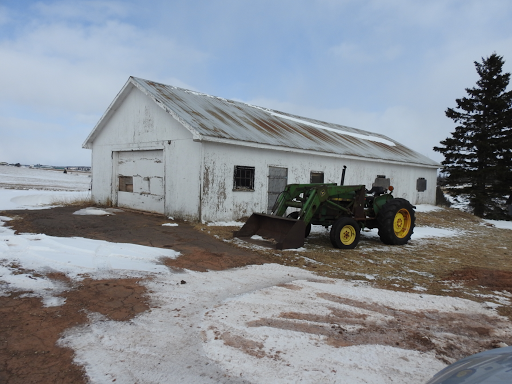 Lucy's son will use the old tractor which still operates. Some of the thirty-three acres will grow crops. 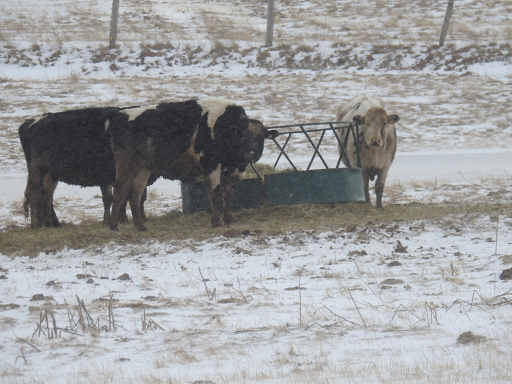 Nearby, some of the neighbours look on. The old farm is moving into the twenty-first century but I wonder when the next renovation will be? Will those people in the future ponder its construction, builders, and owners like we did on this cold day? Only time will tell.